Urban agriculture is becoming a hot topic in sustainable farming circles as more people become interested in organic foods, healthy eating choices, and environmental topics. Given population densities in some areas, “urban agriculture” might seem like an oxymoron to some, but with careful planning and a sense of adventure, even a tiny plot of land can yield a bumper crop. Longtime friends Eric Toensmeier and Jonathan Bates certainly demonstrate the type of strategy and passion required for the effort. 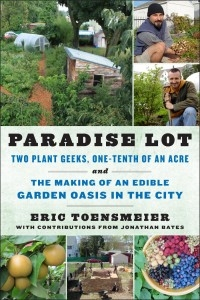 In their charming, insightful description of their tiny urban garden in Holyoke, Massachusetts, the two cover twelve years of growing, from their initial reaction to seeing the compacted, gravel-edged soil, to the moment when they have to consider the long-term future of their growing families, which likely means leaving their garden paradise. Along with relaying various missteps and challenges, Toensmeier (with occasional contributions from Bates) layers together their experiences with natural pesticide controls, wild mushroom foraging, city regulations, berry plants, forest gardens, chickens, having girlfriends move in, trellis systems, and an array of other topics. Dividing the garden’s history into four sections—sleep, creep, leap, and reap—Toensmeier creates a combination of personal memoir and permaculture guide. Filled with insight, but not too technical, he strikes an artful balance between giving useful detail and geeking out on gardening nuances. Although readers who want to learn more about compost and chicken coops may get the most out of their journey, Paradise Lot will still be a delight for someone who can’t even grow a houseplant. As Toensmeier and Bates demonstrate, it doesn’t take twenty acres to start a garden filled with nourishing vegetables and gorgeous flowers; it just takes some vision, especially if the potential garden is a scruffy urban lot.